Pass the Chiclets: bookmarks: (how) do you use them? bookmarks: (how) do you use them? 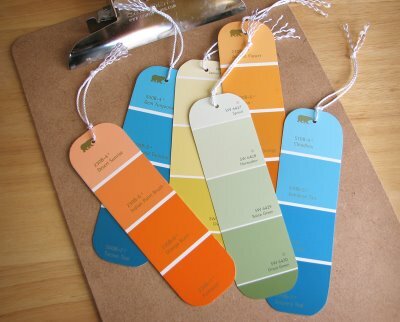 A genius way to make cheap and colourful bookmarks: paint chips! I use bookmarks. I use bookmarks like the Type A person I am. Bookmarks must match the size and proportion of the book they're in; stiffer bookmarks go with hardcovers, while flimsier ones go with paperbacks. It's all to ensure that flipping open to my spot in the book is easy peasy, because nothing annoys me more than putting the book down, picking it back up later and flipping madly through attempting to locate the one page. This means I need a variety of bookmarks. And when all the hardcover-sized ones are "checked out", I'm forced to use smaller, skinnier ones for big books. So I end up improvising bookmarks. Yes. That's two make-up adverts, a thank you card and a sticker sheet. I've also used postcards and expired bus passes. Hey, if it's made out of card stock, I'll use it. But only with the appropriately-sized book, of course.